Unlike many walls, where windows punctuate the signs, here the windows came first and the sign for Globe Electrotype Co. has been designed to fit around the windows. The words "General Printers" and "Eighth Floor" seem to be part of the same design, neatly separated by the next window down. Globe Electrotype was located in this building from 1912 to 1932. The company was incorporated in 1907, with directors Conrad Meyer, Henry Meier, and Lew Wallace (New York Times, 11 Jan 1907, p. 12). Some of the people connected with Globe Electrotype include: Lew Wallace (born Illinois, July, 1866), one of the original officers. He continued with Globe until at least the early 1930s. There was also Arnold Schwartz (1872-1963), born in Argentina, immigrated to US ca. 1890. He was connected with the Art Color Printing Co. from around 1909, then became president of Globe Electrotype in the early 1920s. Richard Edward Crowe (1882-1966) listed his occupation as "Manager Electrotype Foundry, Globe Electrotype Co." when he registered for the World War I draft in 1918. He is listed as secretary-treasurer of Globe in the early 1930s. The dictionary definition of Electrotype is "A metal plate used in letterpress printing, made by electroplating a lead or plastic mold of the page to be printed." And Electroplating is defined as "The art or process of depositing a coating (commonly) of silver, gold or nickel on an inferior metal, by means of an electric current." 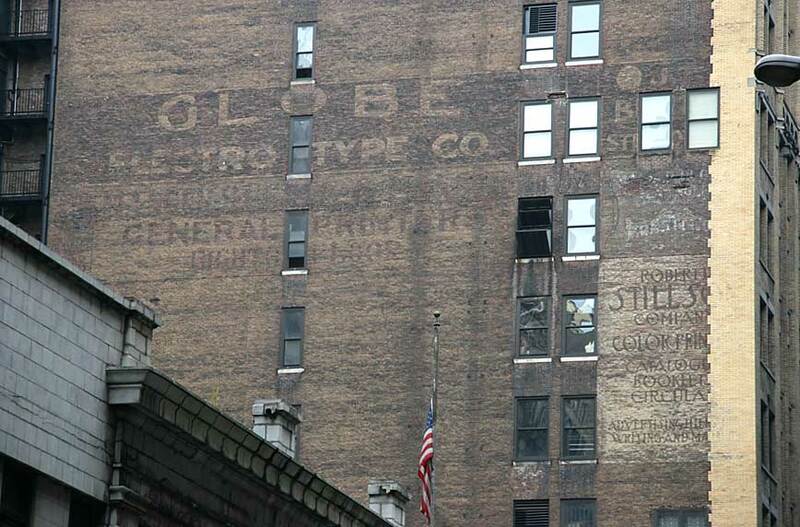 Also on this wall is a sign for Robert L. Stillson Co. Color Printers (click for detail). Although Robert L. Stillson (ca.1864/65-?) specifies in the U. S. Census of 1920 that he is "President, Robert L. Stillson Co.," it is likely that his son, Robert L. Stillson, Jr. (1888-? ), was running the company by that time. In 1920 Stillson Sr. was living in Palma Sola, Manatee County, Florida (this is near Bradenton, south of Tampa Bay), while Stillson Jr. lived in New Dorp, Staten Island. Robert Stillson Sr. was a printer in Brooklyn in the late 1880s, and founded his own company in Manhattan (514 Pearl St.) around 1897. Robert L. Stillson Co. was located at 122 Centre St. from 1902 to 1911, then moved to 209 W. 38th St., where they stayed until 1916. In 1916 the Robert L. Stillston Co. was one of the first tenants to move into the new Printing Crafts Building at 461 8th Ave. Supposedly at the time the largest in the country devoted to publishing and printing, the Printing Crafts Building is a 22-story building located on the west side of 8th Ave. running the full block between 33d and 34th Sts. (Click for name above doorway.) Stillson stayed in business here until 1946. However, Robert Stillson Jr. appears to have lost control of the company sometime around 1930. The company name changed to Stillson Press Inc. in the late 1920s, and Stillson is described in the New York City Directory of 1933/34 as president of the Pencraft Press.